Our Microsoft Office SharePoint training courses will show your organization how to utilize the software to facilitate collaboration, provide content management features, implement business processes, and supply access to information that is essential to organizational goals and processes. Your training will help you to quickly create sites that support specific content publishing, content management, records management, or business intelligence needs. You will also be able to conduct effective searches for people, documents, and data, participate in forms-driven business processes, and access and analyze large amounts of business data. Microsoft Designed the software to work effectively with other programs, servers, and technologies in the 2007 Office release. For example, with Microsoft Office PowerPoint 2007, you can create a slide library on an Office SharePoint Server 2007 site that allows other users to pick specific slides for their own presentation and receive notifications and updated versions when the slides have been modified. 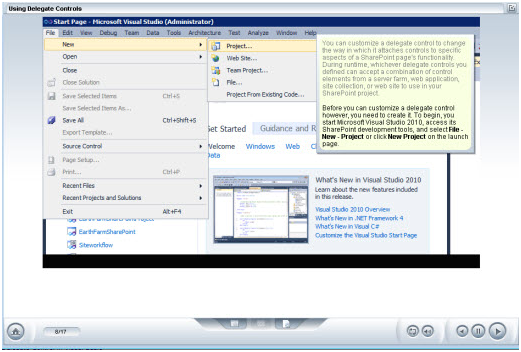 Click here for more examples of how specific 2007 Office release programs are integrated.